Amsterdam, The Netherlands (March 17, 2010) – TW Steel celebrated the start of BASELWORLD 2010 by unveiling its new ‘Renault F1 Team’ collection – the first executions produced as the Dutch watch brand beings its associations as ‘Official Timing Partner’ to the Renault F1 Team in 2010. TW Steel’s newest offerings are based on two separate design platforms. 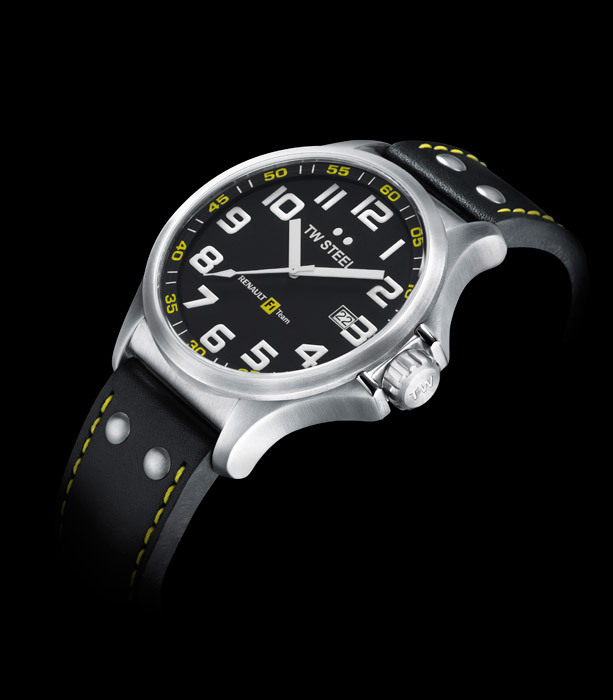 The four-model ‘Renault F1 Team Pilot’ collection celebrates Renault’s early association with the aviation industry and specifically the origins of the first oversized watches. 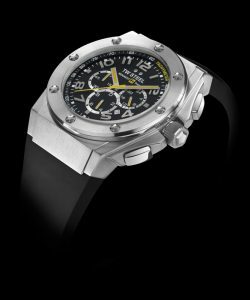 The ‘Renault F1 Team CEO Tech’ collection, also with four-models, offers a more luxurious edge to TW Steel’s partnership embracing the team’s world championship winning pedigree. “This was an exciting project for me and I’m please that we have a collection that reflects both the best of TW Steel and the Renault F1 Team,” stated Ton Cobelens, TW Steel’s Chief Design Officer. The TW670 (45mm) and TW671 (48 mm) Pilot models feature a three-hand, big caliber movement on a bold black dial sporting the Renault F1 Team logo. The TW672 (45mm) and TW673 (48mm), also in the Pilot collection, feature a chronograph movement with all executions using a hardened mineral crystal and black leather straps – complete with TW Steel’s two steel dot signature. The TW680 (45mm) and TW681 (48mm) in the CEO Tech collection feature a chronograph movement able to measure and display time to 1/20th of a second with real sapphire crystal – a rarity for a watch with these case dimensions. The steel case is complimented by the use of a soft black silicon rubber strap. The TW682 (44mm) and TW683 (48mm) editions, both with a chronograph movement, feature AA-grade black PVD coating on the case. The crown and screws on the bezel utilize AA-grade gold plating for further distinction. All Tech watches are waterproof to 10 ATM. TW Steel, the name meaning ‘The Watch in Steel’, can be found at BASELWORLD 2010 in Hall 1.1, ‘Hall of Desires’ – Stand No. A71, March 17th – 25th, 2010.